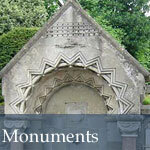 In 2000 Minerva cleaned, repaired and recarved various elements to this interesting monument. 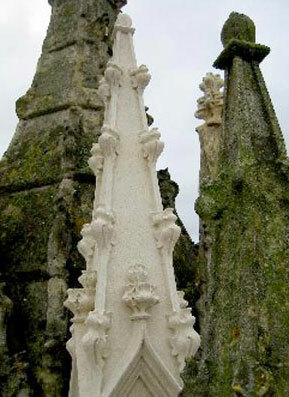 Riddled with original construction phase corroding ironwork, many stone elements were irrepairable and had to be recarved and refixed on stainless steel fixings. A plaque attatched to the side of the cross records the sad tale of Ruth Pierce, a widow from the village of Potterne whose death highlights either the power of superstitious thought or of divine retribution, depending on your point of view. She was one of a group of women from the village who had come to Devizes market to buy grain on January 25 1753. An inquest heard that Mrs Pearce and three others bought a sack of grain between them. When the women came to settle up their money was threepence short and it was claimed Mrs Pearce owed it. She said she had already paid and "called upon the Almighty for witness and wished she might drop down dead that minute if she had not paid it,'' the inquest heard. She repeated the claim and the next minute she did indeed drop down dead. The inquest could find no other cause of death than "the visitation of the great and almighty God'' A painted board recording the incident was fixed to the wall of the market house. A similar inscription was placed on the Market Cross, presented to the town in 1814 by MP Henry Addington, the first Lord Sidmouth, adding the words "having the money concealed in her hand", to point the moral further. 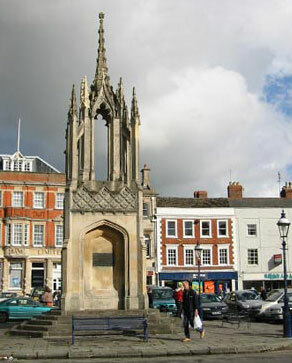 The Market Cross soon came to be known as the Ruth Pierce Memorial. The original inscription was replaced with the present bronze plaque in the 1970s.